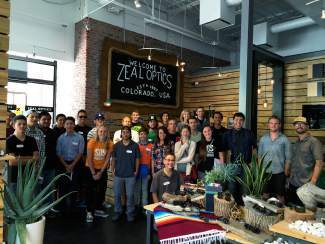 SOS Outreach participants tour corporate offices of ski industry companies, including Zeal Optics, during an event Aug. 12 in Boulder. VAIL — SOS Outreach held its first Industry Day Aug. 12 in Boulder. A group of 22 high school SOS participants from Eagle County, Summit County and Denver toured the corporate offices of Zeal Optics, Active Interest Media, Sea to Summit and Vail Resorts, and heard from Hillary Harding of the Outdoor Industries Women’s Coalition. Many of these youth hope to gain work experience in a field that supports their passions. Industry Day gave them a chance to listen to industry reps, see the offices, ask questions and gain a better understanding of the opportunities to become involved in the world of outdoor sports. SOS Outreach is a youth development program that helps at-risk youth overcome obstacles to lead healthy and successful lives. The organization is unique in providing long-term engagement for at-risk youth ages 8 to 18 by combining outdoor adventure activities with a core value curriculum, group mentoring, leadership and service learning opportunities in the community. Industry Day was a perfect opportunity to help long-term participants learn about potential future careers. While eating tacos from Illegal Pete’s, another sponsor of the day, Hillary Harding of the Outdoor Industries Women’s Coalition, told her unique story. From starting out as an outdoor guide to being involved in the nonprofit sector, Harding shared the importance of speaking up and asking questions in order to push you from the background into the foreground. The day closed out with a nine-person leadership panel organized by Vail Resorts and EpicPromise, at the company’s headquarters in Broomfield. EpicPromise is SOS’ biggest corporate sponsor — every year the program donates ski passes, lift tickets, instruction, lunch vouchers and gear to more than 3,000 at-risk youth through SOS programs. The leadership panelists included employees from almost every department, from human resources to project management. For the youth, it was an opportunity to have questions answered, and it opened a world of possibilities beyond the lift operator and guest services positions that are easily visible at resorts on SOS ride days. Vail Resorts also provided SOS youth with information on potential college programs and job opportunities. Youth talked with Vail Resorts employees over ice cream sandwiches and appreciated the opportunity to learn how a job can be more than just a way to make money.